Betty Ann Bryanton Serves Up a Little Sweet and Smooth Jazz with Your Monday Night Coffee"
Since 2007, Betty Ann has been concentrating almost exclusively on vocal jazz. She is known for her charismatic stage presence and her clear, warm, emotive voice. In mid 2016, Betty Ann Bryanton, David Miller, and Howard Tweddle embarked on a new project. In a tribute to Canada’s 150th, Betty Ann reached out to jazz composers across Canada in hopes of finding new material. The response was very generous and resulted in a wealth of material from composers from every part of the country — more than enough to fill a 2-hour show. Impressed with all the music, the trio had a difficult time making final choices. The Trio has already presented the material to two sold-out audiences. 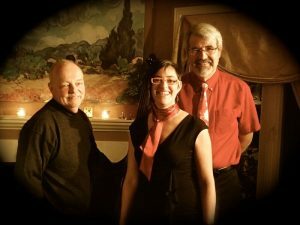 Inspired by Oliver Jones’ farewell concert, when he reminded us to not forget the great jazz being created ‘right here in our own backyard’, The Betty Ann Bryanton Trio is looking forward to introducing Merrickville to some of their new favourites that have been sourced from local composers. "Betty Ann Bryanton takes her musical revenge, to a happy full house"